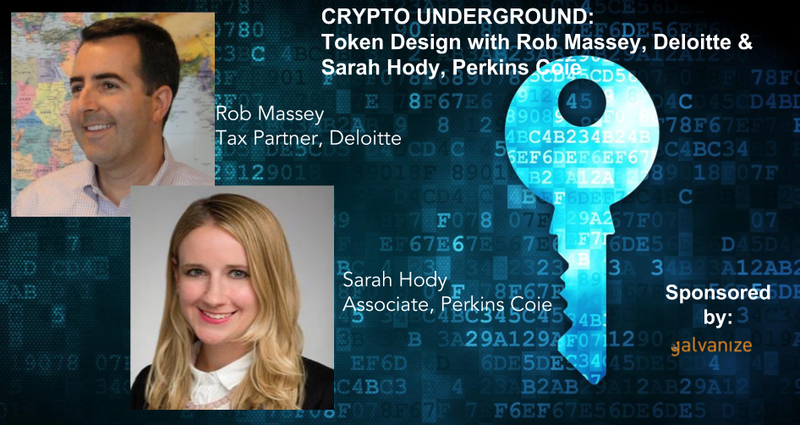 For those of you thinking about token design, I thought it might be helpful to type up an interview I did at Crypto Underground with my friends, Sarah Hody, Associate at Perkins Coie and Rob Massey, Tax Partner at Deloitte. Combined, they have almost 10 years of blockchain experience, which definitely makes them industry experts in this new field. Below are the topics discussed by Rob & Sarah. You can watch the Facebook Livestream here. Because of the length, I’m going to split up the content between several posts. Q: With all the entity structures and jurisdictions to choose from, how should founders start thinking about how and where to form their blockchain company if they plan to raise capital via an ICO? According to Rob, there’s a myth that the sale of a token is just a transaction but in reality, it’s quite meaningful. A token sale differs from a traditional fundraising instrument, which are generally tax efficient. Currently, all token sales are taxable - the only question is when & how - which is why the jurisdiction you incorporate in matters. Don’t get caught up in trying to design an elaborate structure schemes. Don’t design a structure that you’re not going to live in. Unless you plan to go live in Malta or the Caymans, just do what’s natural. Set up shop where the core of your business is going to run and focus on building your business. It’s really hard to be tax efficient if you’re a global entity. Picking one spot can be a challenge for many crypto entrepreneurs due to their nomadic tendencies but you have choose! If you’re selling a security, it may actually be more tax efficient to stay in the US according to Sarah. You need to be able to answer the question “What is your token going to do?” and have it thought out before you decide where to incorporate. Rob asks people to first imagine their business model - how the token acts and is used in its mature state. Then, they’ll work backwards to determine the tax considerations. So the legal teams set up the “guardrails” to make sure no one is going to jail (because “normal clothes are better than wearing orange”) and then the tax teams will work within the legal constraints to determine an optimal tax structure. Q: What about forming dual entities - a Foundation or Non-profit paired with a Corporation? Unless you truly have a strong desire to set up a true Foundation that’s going to positively contribute to society and be a true non-profit, then this is probably not the path you want to go, says Rob. If you’re just trying to use the Foundation as a guise to run a profitable business and make money; it’s a bad idea. This doesn’t work well because you don’t have a good way to get the tokens out of the Foundation and into the business entity. You also need ruling from IRS to set-up Foundation which takes a while. Sarah advises all companies to set-up shop in Delaware because of the well established case law. Investors are comfortable with their laws and less due diligence is needed. It’s the best place to be incorporated in early stages. Additionally, if you’re providing internet services, you’re likely going to be hitting up against law in every state. So the “havens” being set up in various states likely aren’t that compelling when you compare them to the benefits Delaware provides. You do battle where you incorporate. Taxes kick in where your clients are. So even if you set up in DE or overseas somewhere, but live in CA, you’re still subject to CA laws. Q: What if you don’t plan to raise traditional VC money? Q: Collectables seem to be popping up all over the place. What are they and how are they treated for legal and tax purposes? CryptoKitties is a game run on the ethereum network centered around breedable, collectible, cats. Each cat is one-of-a-kind and 100% owned by you; it cannot be replicated, taken away, or destroyed. Sarah thinks CryptoKitties are awesome because it caused ethereum network to become more easily accessible - distributed applications became alive in real-life. Collectables like CryptoKitties are easier to deal with from a legal perspective because there are better analogies to existing structures, like gold. With CryptoKitties, you start with an original cat, run a smart contract with another cat, and violà! You’ve created a 2nd generation version of those cats. From a tax perspective, collectables are non-fungible and are comparable to gaming where you might own something within the game but it can only be used within the confines of the game itself. If it’s not something separate from the game then you don’t own it and it’s not taxable. If it’s something that’s tradable outside of the control of the company, like CryptoKitties, then it becomes more of a property. This occurs when you’re able move something between people or businesses. This transfer becomes a barter transaction which is a taxable event.